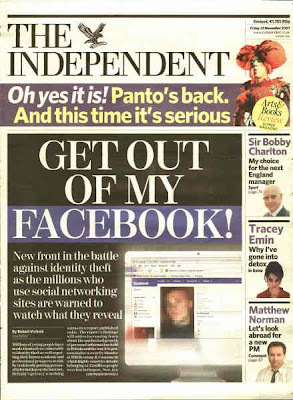 Today's Independent newspaper has Facebook on it's front page as part of a big feature on internet privacy and data protection. "Millions of young people have made themselves vulnerable to identity theft as well as putting their future academic and professional prospects at risk by recklessly posting personal information on the internet, Britain's privacy watchdog warns in a report published today. The report's findings will add to increasing fears about the unchecked growth of personal information held in Britain and the way it is protected after a security blunder at HM Revenue & Customs in which highly sensitive details belonging to 25 million people were lost in the post. Now, in a far-reaching study of the internet behaviour of young people, the Information Commissioner's Office (ICO) says that 4.5 million web users aged between 14 and 21 could be vulnerable to identity fraud because of the carefree way they give up information on the internet, especially when visiting social networking sites. A similar number are damaging their future education and employment prospects by leaving an "electronic footprint" which could compromise their chances of winning places at colleges and companies." Is the Independent trying to sensationalise this or should we all be concerned about our online data?